In April, the 51st ACM Awards telecast returned to MGM Grand Garden Arena in Las Vegas, with hostsLuke Bryan and Dierks Bentley, which reached 11.2 million viewers on CBS. And for the first time ever this fall, ACM Honors became a televised special reaching more than 4 million viewers. In addition, the ACM-constructed one-of-a-kind musical collaboration featuring Keith Urban with Dierks Bentley and Little Big Town in the Stand Up To Cancer (SU2C) telecast reached nearly 8 million viewers. Both specials aired on Friday, September 9, 2016, with SU2C preceding ACM Honors on the CBS Television Network, for a combined viewership of 11.7 million. 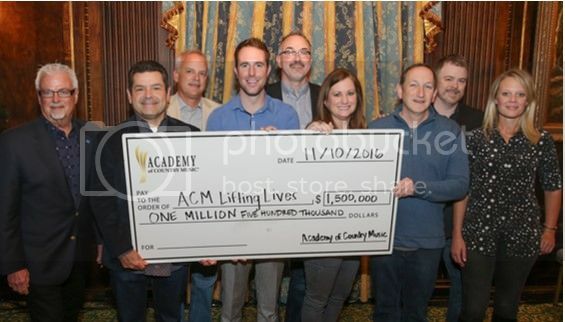 Ticket proceeds from several 2016 ACM events went to the ACM Lifting Lives donation, among other Academy contributions. To date the Academy has given over $8 million to ACM Lifting Lives, resulting in more than 100 grants, 75 emergency grants to music industry professionals in need, and partnerships with Music Health Alliance, Seacrest Foundation, St. Jude, Vanderbilt Kennedy Center, among many, many others. PHOTO: [Left to right] Academy of Country Music Officers and ACM Lifting Lives Board of Directors: Paul Moore (Parliamentarian), Carmen Romano (Treasurer), Duane Clark (Vice President), Tommy Moore (Secretary), Ken Tucker (Chairman), Lori Badgett (Past ACM Lifting Lives Chairman), Ed Warm (ACM LL Chairman), Ben Vaughn (President), and Tiffany Moon (ACM EVP, Managing Director). Founded in Southern California in 1964, the ACADEMY OF COUNTRY MUSIC (ACM) is a fan-focused artist and industry-driven organization, providing the financial resources to ensure the on-going philanthropic work of ACM LIFTING LIVES, the charitable arm of the Academy which works to improve lives through the power of music. The Academy has a rich history in the entertainment industry, having been founded when Southern California was a hotbed of emerging country music and when Westerns were a staple of television programing and film production. Comprised of more than 4,900 professional members nationwide, the ACM is headquartered in Encino, Calif. For more information, log onto www.ACMcountry.com or www.ACMLiftingLives.org.